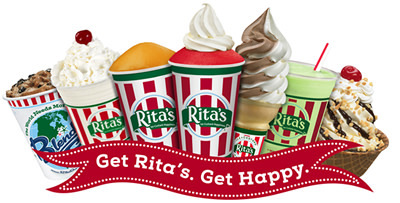 From a small porch front in 1984 in Northeast Philadelphia and a seasonal phenomenon, Rita’s continues to see unprecedented growth as it continues to grow across the nation becoming a year round spectacular with its cult-like following. Rita’s “made fresh daily” Italian ice obsession is hitting everyone’s taste buds and creating a passion not just for the brand but the opportunity to become a Rita’s Italian ice franchise owner. It’s no wonder we are wired for success and fueled up for our expansion not only across the nation, but internationally we are making our presence known. Rita’s franchisees come from all walks of life with one thing in common -the desire to choose their own destiny with a proven system providing on-going support; not to mention all having a passion for Rita’s cool treats and foregoing happiness. There’s no better time than today to begin evaluating the Rita’s business model. Why not get a taste of success and view our fresh and desirable products! It’s well documented that the heritage of modern day Water Ice dates back to Ancient Rome and Greece. It is said that the Romans would often infuse handfuls of Mount Etna’s snow with wines and syrups as a special delicacy. In fact, Sicily is often cited as the birthplace of modern water ice as far as the Western world is concerned. The flavors most common to the western part of Sicily are still among those that are popular today: lemon and coffee. The story of Rita’s Italian Ice dates back to the sweltering summer of 1984 when Bob Tumolo, a former Philadelphia firefighter, decided to open a small Italian Ice business to augment his income. Tumolo opened his first store in Bensalem, Pa. and named the business after his wife, Rita. From a single store on the porch of a home in Philadelphia in 1984, Rita’s Ice has grown tremendously. In 2005, Rita’s had more than 300 locations and in November 2007, Rita’s opened its 500th location in Mooresville, North Carolina. Rita’s marked a special milestone in 2009 when the concept celebrated its 25th anniversary. Rita’s Ice is now a part of the Falconhead Capital, LLC family. Falconhead employs a team of dedicated professionals, all of whom have extensive experience developing and supporting new growth strategies, strengthening management teams, recruiting high quality board members and supporting technology improvements and upgrades. Now, over 600+ outlets strong and celebrating our 3oth anniversary spreading Ice.Custard.Happiness, Rita’s unparalleled growth continues to offer vast opportunities not only across the nation, but internationally too. “The World Needs More Rita’s” and we are currently living up to our motto by expanding to all parts of the globe. Our Business is Treats. Our Mission is Happiness. Lace up your skates and eliminate the trials and errors of starting a new business on your own. Our process helps you ask the right questions to learn as much as possible about our concept and business model. As you begin our four to six weeks discovery process, you will learn how to be in business for yourself, but not by yourself. During the process you will gain the necessary information to decide whether a Rita’s franchise is the right choice for you. 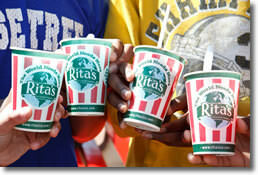 Rita’s Franchisees possess a passion for the brand and serving Ice.Custard.Happiness to guests and families. Step 1: Complete Rita’s Confidential Application. Step 2: Review Rita’s Franchise Disclosure Document “FDD”. Step 3: Complete due diligence –speak with existing franchisees. Step 4: Participate in an operational interview with Rita’s Franchise Service Manager. Step 5: Participate on a call with Rita’s Senior VP of Franchise Sales to discuss selection process/timeline. Step 6: Attend discovery day, meet Rita’s franchise selection committee and determine franchise award. Step 7: Sign franchise agreements. After signing your franchise agreement, our experienced team of real estate and development professionals begin working with you one on one. Step 8: Begin site selection and negotiate your lease. Step 9: Begin construction and conduct employee training. Step 10: Open your store and plan your grand opening event. Our franchisees come from all walks of life. From never owning a business to existing business owners or entrepreneurs. Our comprehensive training program and marketing is focused on building and sustaining a profitable business and strong brand identity. Franchisees benefit from a robust support system that includes everything from in store service and operations to field training. Our unparalleled level of support is what makes us the #1 Italian ice franchise across America. Rita’s franchisees receive guidance in all phases of the start-up process. Our support ranges from site selection to grand opening advertising, a business plan, and everything in between. In addition to start-up support, Rita’s offers ongoing marketing support ensuring you utilize the necessary tools to promote and sell the latest product offerings. 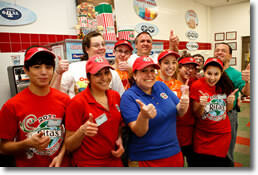 Rita’s continues to support franchisees throughout the life of their franchise. Rita’s ensures the highest standard of operational procedures to maximize sales and profitability including hands on assistance, support from experienced and trained operations service managers, franchisee advisory board, area developer support and corporate staff guidance. Rita’s provides a strong communication program that includes immediate updates on a proprietary website, Rita’s CoolNet. Additionally, Rita’s provides weekly email updates, community newsletter and brand forward e-newsletters, webinars and an Annual Franchisee Business meeting. Opening a Rita’s Italian Ice franchise requires a strong personal commitment and active involvement in store operations. Franchisee approval is based on a number of factors, including integrity, personal and financial qualifications, a high level of energy, positive attitude, dedication and leadership abilities. To ensure that our franchisees will be able to qualify with both lenders and landlords, we require that potential franchisees interested in a single store opportunity have at least $ 100,000 in liquid capital and a $300,000 net worth. Please call Heidi Gardner directly at (800) 677-7482. 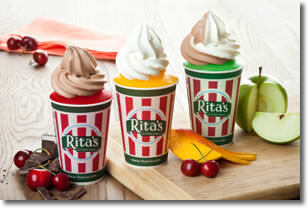 Rita's Italian Ice is currently accepting inquiries from the following states: Wyoming, West Virginia, Wisconsin, Washington, Vermont, Texas, Tennessee, South Carolina, Rhode Island, Oregon, Oklahoma, Ohio, New York, Nevada, New Mexico, New Hampshire, Nebraska, North Dakota, North Carolina, Mississippi, Missouri, Minnesota, Michigan, Maine, Massachusetts, Louisiana, Kentucky, Kansas, Indiana, Illinois, Iowa, Hawaii, Georgia, Florida, Washington, D.C., Colorado, Arizona, Arkansas, Alabama, Alaska.